I've been meaning to get along to see the Craft Council exhibition Lost in Lace since it opened before Christmas and this week I finally made it. The show stopper for me was this ethereal installation of white cotton gowns in a web of black thread - just beautiful. 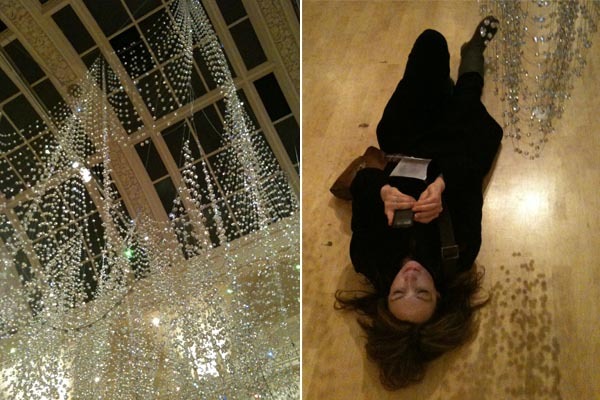 I love this picture that Graham took of me whilst I was snapping this crystal chandelier. Lost in Lace is at the Birmingham Museum and Art Gallery. If you want to catch it you'll need to be quick - it closes this weekend. I love these ceramics by Louise Taylor via The Foodie Bugle. More lovely work by Ptolemy Mann who I featured recently on the homebuildlife blog. Get 20% off everything in the Conran for M&S range this weekend - enter code CONRAN20 online (ends Monday 20th Feb). Thanks for reading this week and for your comments. I really do appreciate every single one of them. If you haven't yet entered the Design Hunter giveaway to win a copy of 'A Girl's Guide to Decorating' here's how you can enter.